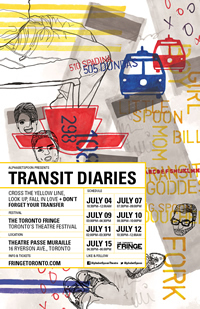 Transit Diaries (playing at the Theatre Passe Muraille Mainspace) urges us to reconsider the role that the TTC plays in our lives. Yes, yes, okay: the bus takes us from place to place. But does it move us in other ways as well? What secrets do bus drivers know? What relationships blossom–and collapse–while in transit? And what do we miss when we sit silently, staring out the window, waiting for our stop to arrive? The Toronto Fringe Festival is often light on Toronto-centric shows, so it’s nice to see something so strongly rooted in our local culture and traditions. And it’s a good show at that. The production focuses on 7-8 key characters: Big Spoon and Little Spoon navigate the borders between love and friendship; Boy and Girl find love, or something like it; Mom has secrets which might tear her family apart; Bill has secrets which will thrill and amuse you; and Transit God, omnipresent and omniscient, carries us along the way. The cast is young and energetic, which is both their main strength and, occasionally, a weakness. The themes they’re exploring require a light, careful touch, and the youth of the company adds a good deal of oomph to the obligatory Facebook and Twitter jokes–but the show is often a little too cute. From time to time, I found myself expecting actors to cut away from a scene, turn to the audience and give us a nice juicy wink, just to let us know they were in on the joke. There is some genuinely touching content here: Mom’s final monologue; Big Spoon’s great romance; Bill and Transit God swapping stories about the surprising stuff left behind on buses. The company tries very hard to make it work, but many of them appear to have trouble projecting their voices in the somewhat cavernous TPM Mainspace–compounded by the questionable choice to have some lines read with the actor’s back to the audience. The lighting also needs a little work: several important bits of business take place in total darkness, while other blackouts last far too long. But the company is just so joyful and happy to be here, and the material so strong, that we can easily forgive these technical problems. There’s a very good show beneath these bumps. Poster designed by Maureen Mendoza.